Completely change your Windows appearance easily! Windows personalization out of the box generally boils down to being able to change your desktop wallpaper, the Aero stuff, and various fonts. But you can’t theme the entire Windows experience, such as the start menu color, or anything to do with explorer.exe frames – not without installing shell themes, which is what this guide will walk you through. Installing shell themes is generally quite safe, it just involves modifying some Windows .dll files – please note that if ever you run /SFC in the command prompt, your modified .DLL files will get overwritten with the original ones from Windows, which will break your shell themes. But its easy to just modify them again. 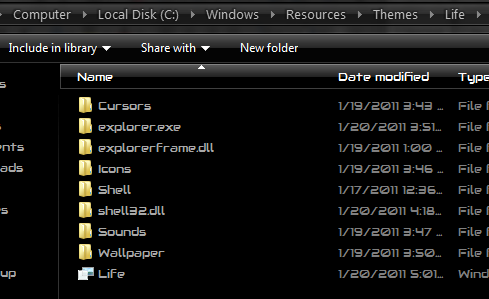 The screenshots below are using Life by Lefty1981 shell theme, because once you go black you never go back, but you can find a ton of shell themes to suit your preferences on websites like DeviantArt and Windows7Themes. Explorer.exe: This will typically change things like the Start orb. Explorerframe.exe: Typically includes images to replace things like forward/back/exit buttons on menus. Shell32.dll: Changes the appearance of control panel icons and things like that. Shell themes generally come with instructions and descriptions of all the extras they include, so be sure to go through the readme of whatever shell theme you’re installing to know exactly what is being changed. For doing this, you need to take ownership of the files in both system32 and sysWOW64. So for example we are going to overwrite the ExplorerFrame.DLL in both /system32 and /sysWOW64 with the ExplorerFrame.dll files from Life theme, which will allow us to change the various explorer frame buttons. 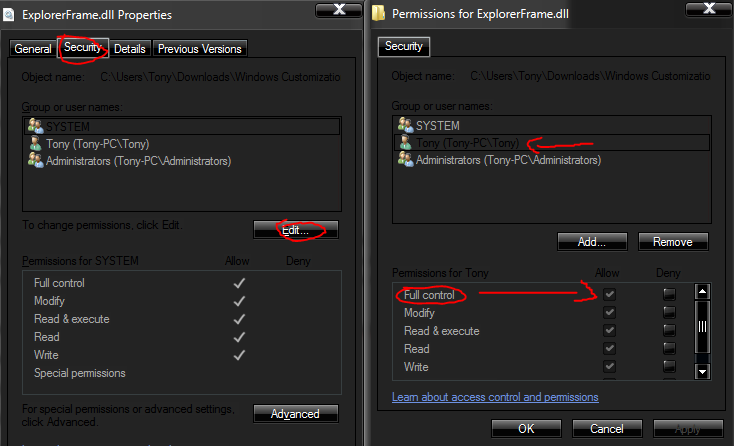 Now you will go into both folders, right-click the ExplorerFrame.DLL files and go to Security tab -> Edit -> highlight your username for your PC -> hit the checkbox for Allow Full Control, as seen below.